Thanks so much, Eva. This is enormously helpful. I'm so used to this kind of mis-information that when I read the press reports I just tell people to 'wait and see". It sure helps to have the specifics. Wow you are amazingly hot...are you single? Can we get together some time? You stated that the Chavez government is allowing violent protest, you then stated that this is something the US government would not permit. I am not sure of the logic of this particular statement. I understand the democratic right of protest, but I also understand the need for law and order. I fail to see how permitting the violence you mentioned to take place is a good thing, could you please explain the thinking behind this.? I wonder who names these "revolutions"? This is the first time that I have seen the term "Marigold Revolution" used and it really doesn't seem to fit. I wonder why a flower revolution rather than a color revolution. The Myanmar movement was the Saffron Revolution which is also a flower but at least "saffron" has an eastern, Buddhist quality. I cant trace the term any further back than a Stratfor.org article. It was in that article that I learned that the first of these movements, the Serbian Otpor, subsequent to the fall of Milosevic's government evolved into the Center for Applied Non-Violent Action and Strategies (CANVAS) who are closely linked to The Albert Einstein Institute. The article further states that in 2005, CANVAS turned its attention to Venezuela, and on Oct 5 ...five student leaders from Venezuela arrived in Belgrade for training. If I were the Venezuelan opposition student movement I wouldn't be satisfied with the name. It just is not Latin enough, it doesn't have any sizzle. Granted, it's not "Pansy" or "Buttercup", but it is close. Why are Latins letting a bunch of Serbs name their "revolution". Hey, I just realized why a "flower" revolution. It's the sixties, man, you know, like the flower people. Far out, dude. 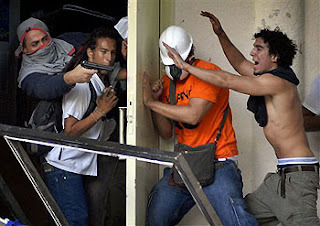 Eva, with all respect, but police units do not act this way if they free histages and one of these guys (even shown in your photos) has been identified as working for PDVSA. How do you explain that ? Nobody in the world will accept your version of this history...After the tascon list, the abstention a the election, the close contact with the facist state Cuba, it would be amazing to believe that chavez is doing a fine job...Please wake up...Por favor despierta te ! Wow Eva, so I guess you mean to say that there is no freedom of speech in the US but yes in Venezuela? How about closing down TV stations, or revamping a Constititution to allow ONE person to rule until his death, just like let's think> oh yes, CUBA? I don't mind your bias or political view, but do question your tactics; the means justify the ends? Don't keep on waiting to see...just open your eyes. You have the right to speak...but I do wonder why we give you the right to think? Listen, can you verify the specifics for us? How about this one; Chavez is going to rule for ever...there is no disputing this fact if he is successful in revamping his country's constitution; I wonder what you would think if Bush tried doing the same??? Should I post this by Yoshie Furuhashi of MRzine? After all it notes the piece by Stephen Zunes, notorious "social fascist", I just sent. It would be a counter-revolutionary act to draw further attn. to Zunes wouldn't it? On the question of Western "NGO"1 interventions in nations of the global South and their relations to the US-led multinational empire, there regrettably is no consensus on the broadly defined Left. The lack of consensus even among leftists makes it impossible to raise the consciousness of the Western public about the roles of "NGOs" in the empire's "regime change" campaigns, which negate the essence of democracy in the name of "democracy assistance." I doubt that Eva Gollinger or Michael Barker has been able to persuade Stephen Zunes that leftists shouldn't be serving as "chair of the board of academic advisers" of the ICNC (Zunes, 31 August 2007) or otherwise supporting it or any other institution like it. Can anyone? 1 I put the term "Non-Governmental Organizations" between quotation marks, for some of the "NGOs" in question are wholly or largely funded by the United States government and other governments of the multinational empire. The Solidarity Center is a good example: "A well-kept secret about Solidarity Center is that it received 90% (nearly $30 million) of its annual revenue from the U.S. State Department and other government agencies of the Bush administration, but it got less than 2% ($600,000) from the AFL-CIO. These figures are from Solidarity Center's 2003-2004 Annual Report" (Harry Kelber, "How Sweeney Won Three Sham Re-elections; His Role in ULLICO Scandal and Elsewhere," Labor Educator -- downloadable in PDF at laboreducator.org/sweeneyres3.pdf). In choosing Freedom House as the venue for a foreign policy address this week, President George W. Bush has stepped into an intense debate among democracy activists in the US and Iran on how US dollars should be used to carry out the administration's policy of promoting freedom in the Islamic republic. Few in the Washington audience on Wednesday realised that Freedom House, an independent institution founded more than 60 years ago by Eleanor Roosevelt, the former first lady, is one of several organisations selected by the State Department to receive funding for clandestine activities inside Iran. Peter Ackerman, chairman of the board of trustees, who introduced Mr Bush, is also the founder of a separate organisation that promotes non-violent civic disobedience as a form of resistance to repressive regimes. His International Center on Non-Violent Conflict has organised discreet "workshops" in the Gulf emirate of Dubai to teach Iranians the lessons learned from east European movements. A separate organisation, the Iran Human Rights Documentation Centre based in New Haven, Connecticut, has also received US funding and organised a Dubai "workshop" for Iranians last year that was not made public. Mr Ackerman, who is very wealthy from an earlier career as a financier, says he does not accept government money. Questioned by the FT, Freedom House confirmed it had received funding from the State Department for activities in Iran. It declined to give details but said it was not involved in Mr Ackerman's work in Dubai. Freedom House also disclosed that it received $100,000 (€83,873, £57,500) from Mr Ackerman last year and a further $100,000 from his organisation. It should be noted that Mr. Jack DuVall himself visited this blog to defend the ICNC, merely because I cited the same Financial Times article in an entry whose focus was Freedom House, not the ICNC: "Queering Freedom House," Critical Montages, 24 September 2007 (be sure to read his comment). It looks like opinions of leftists are a sensitive spot for the organization. I have complied a list of US backed organizations in Bolivia. Have you seen/ heard of any of these organisations and what they are doing in Bolivia? 3. USAID opened a branch of the Office of Transition Initiatives (OTI) in La Paz in 2004 4. The Brecha Foundation, an NGO founded by leaders of the Confederation of Indigenous Peoples of Bolivia (CIDOB). According to Eva Golinger USAID-Chemonics in Bolivia run 6 official programs in the areas of ‘Democracy’ - Alternative Integral Development, Environmental Issues, Healthcare and Economic Opportunities. Do you know what is happening with these programs? What are the right-wing civic committees that organized the August 24th actions in Cochabamba against Morales, the Constituent Assembly and secession - doing now? Have they any more plans for actions? The constitutional assembly impasse – what is response from pro-Morales camp? Is there discussion about what to do it the deadline passes and there is no 2/3rds support? Where are the students lining up? 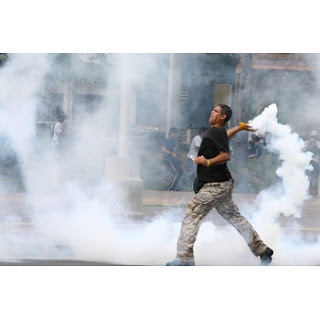 Like Venezuela, are the right-wing using universities to ferment anti-Morales sentiment/activity? What about the military? Is there a pro-Morales camp? Do soldiers come from poor backgrounds, like in Venezuela? Do you know of any activity inside the military by the USA and their front organizations? Hey Eva, Could you please let me know how it feels to be psychotic. I've only read alittle of your site a I'm dumbfounded how crazy and twisted people can actually get. You must be on drugs when you do your investigating in Venezuela. The world would be a better place if people like you never spoke again.